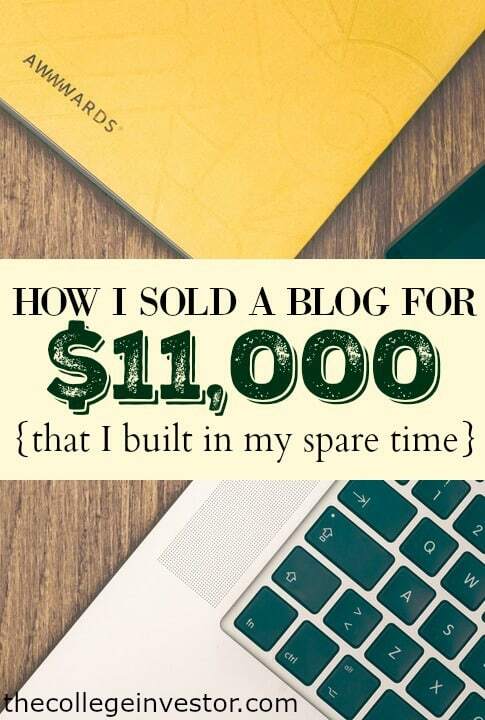 Yes, you read that right – I sold a blog that I built in my spare time for $11,000, and I’m so excited that I did! The whole process – from creating the website to the sale itself was a bit of a fluke, but I’ve received several questions about how I was able to find a buyer, and the process involved, so I decided to share my story and put this guide together for you. You see, I never really set out to build a blog to sell. But like so many other online entrepreneurs, you get an idea, have a few minutes, and you’re down the rabbit hole pretty quick. For me, that happens about one a quarter – and the projects usually end up just idling or disappearing into the abyss of the Internet. Maybe I’ll start a series on failed ideas I’ve tried (I have a folder saved with some pretty awesome stuff). But to the blog – if you’ve ever considered selling a website, or if you’re in the market to buy a website, here’s my story about how I sold a blog, and what I learned about the process. Traveling for work can be tiring, but it’s also pretty boring. After work, you go to happy hour or dinner, then you just waste away watching TV in a hotel room far from home. But that’s not what Internet entrepreneurs do – no, we create businesses in our spare time. And on one occasion, I got the great idea to start a blog about the lifestyle that is online entrepreneurship… it would be a fun mix of some of my favorite topics: business, money, style, and more. In my mind, the website had the potential to turn into an amazing online magazine. Or not. Because after a while, the passion for the new website started to fade. I was building it for the wrong reasons – not because I was passionate about the subject, but because it was another business. And I had a main business, and a side business already. I didn’t need another business that I wasn’t passionate about. So, over time, my entrepreneurship blog was becoming more and more outsourced. It had a staff writer, I would post new content to it once a week, and it was minimal. The site design started to get a little stale (partly because I only spent about $10 on the design via Fiverr and a free theme – if you don’t know what that means, check out our building a blog for dummies tutorial), and I really wasn’t committed to making much content. However, some of the content I did create was making great money through affiliate sales. And, as a whole, the site was making about $10,000 per year by itself without much effort. This easily covered the cost of the website and the expenses associated with hiring a freelance writer to create content. But it wasn’t doing anything for me, and it was still a headache to check in on and make sure things were going as expected. As such, I pondered the idea of selling the website but never took any significant action. I just kept my eyes out for the right opportunity. As any blog owner will tell you, after a period of time, you start to get offers to purchase your website, or you become connected to others who’ve sold their sites and how they did it. While there are places like Flippa.com that you can list your website for sale, there are actually brokers and even private individuals who help sell websites. After speaking with several people who’d sold their sites, I connected with Latonas to sell my site. Almost like real estate brokers, they already had contacts with people who would be interested in purchasing a website in that space. As such, the connected me with several people interested right away. Within a week of listing my entrepreneurship blog for sale, I had three solid offers and each wanted to do a little due diligence. I provided them with reports showing the traffic and screenshots of the income, all so that they could see what the site was doing. After providing them the information, two of the buyers were serious and wanted me to answer a bunch of questions about the business and sale. This is where selling a website is a bit different than selling property. There is an actual business model attached to the site – it’s not just the domain name that the buyer wants. As such, they want to dig into your business, as well as your traffic and metrics. I can be weird, but you have to remember – if you’re buying a blog, you’d like to know that same information too. After I answered all his questions, one buyer finally made an offer on the site. We negotiated for several days, before finally coming in at $11,000 – 1.1x annual revenue for the site. Considering there were about $1,200 in annual expenses on the site – roughly $100 per month – that means it sold for roughly 1.25x annual profit. This is on the low end of the “blog valuation scale”, with many experts arguing that websites should sell from 1.5-3x the annual profit. However, the traffic to the site was low, and I didn’t want to put the time in to scale it. As such, I was fine with the offer. After accepting the offer, we went into escrow, just like you’d go into escrow on a house. However, instead of exchanging a house for money, we were exchanging a domain name and files for money. Escrow.com is the tool we used for escrow, and they have a section designed specifically for selling domain names and websites. By using Escrow.com, everyone is protected. Escrow.com verifies the information on the website with the registrar, and also ensures that the money clears, before anything changes hands. For small website sales, or when working with someone you trust, you don’t need to use escrow – it does cost more! But for this transaction, $11,000 and an unknown buyer, it made a lot of sense. Beyond the domain name and website, I also transferred over all the social media accounts for the website to the buyer. Once escrow was completed, I had $11,000 in the bank! The entire process took about three months. I listed my blog for sale on July 10, I got my first really interested buyers on July 28, and I closed on the sale on September 15. However, most of the work took place in late-August, early-September when I had to transfer everything over to escrow. Now that it’s complete, I’m really glad that I sold my blog. Several people have ask – if it really wasn’t much work, why did you sell it when it was earning you $1,000 per month? Honestly, because it was a weight on my shoulder that was holding my back from earning $10,000 per month. You’re right – it didn’t take much time to manage. But it still took SOME time. And it was still precious time that didn’t align with what I wanted to be doing. It doesn’t hurt that the entire project was purely a side gig started out of boredom. It never hurts to get a five figure paycheck for that. 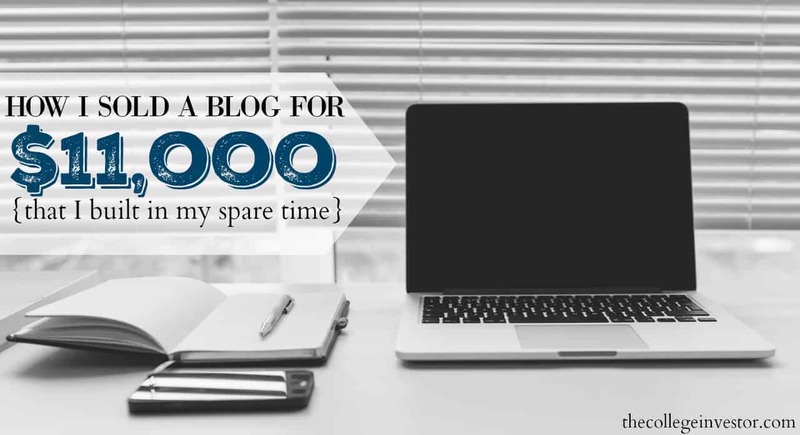 So, the real question is this – are you ready to start a blog? Starting and building a blog is a great side hustle that you can leverage to earn an extra $100 per month – or much more! It’s up to you and the work you put into it. That extra money can be used to pay down your student loan debt, or help you get started investing. If you’re unsure about how to get started, check out our How To Start A Personal Blog Or Website Tutorial that walks you through the whole process. Awesome! I sold three websites last year and made around $30,000. It was so nice! That’s awesome. For me it was a great monetary gain, but also getting the time back was huge. I bet you feel similar, especially given how your main site is rockin’. 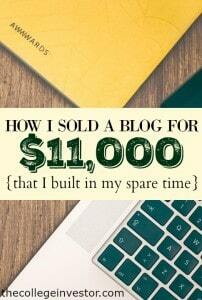 I like the idea of selling a blog that is not your primary one. It provides you with more cash for investing as well as more time to focus on your core site. Bingo – this hits the nail on the head about why I did it. And the time back, even though I didn’t spend much on the site, has been huge.